The Aberdeen winger was hampered by a troublesome hip problem but since the turn of the year, he has managed to find the net six times – treble his tally from the first half of the campaign. He also scored on international duty for Northern Ireland against Estonia and his brace against Motherwell on Wednesday night took him to eight in total. His tally of 78 goals for the Dons puts him one behind Duncan Shearer in the club’s all-time list and McGinn hopes there are many more to come. McGinn said: “I came back from a niggly injury and missed out on the Celtic league game, came back for the Rangers game and scored. The last couple of weeks have been great, scoring goals and going away with Northern Ireland and scoring there as well. My fitness has been good and I’ve been feeling sharp in training. The games are coming thick and fast and it’s all about looking after the body. Thankfully it’s been great recently. Confidence is good. “Being a wide player, I always challenge myself to get to 10 goals every season and that’s me on to eight which is pleasing. I’m up to 78 goals for Aberdeen so I just want to keep chipping away. “It becomes more difficult, being a wide player you’re always trying to create goals but it’s just about getting in the right position at the right time to score as well. All in all I’m pleased with the work that has being gone on recently personally and if I can help the team in any way with goals or assists I’ll look to do that. 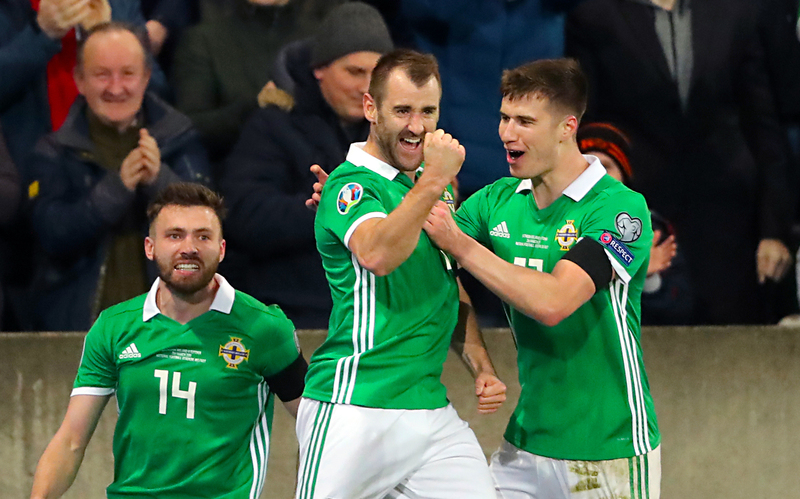 Northern Ireland’s Niall McGinn (centre) celebrates scoring his side’s first goal against Estonia. 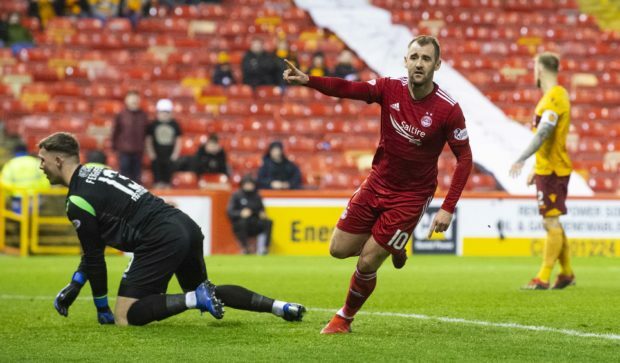 McGinn, in his second spell with Aberdeen after first joining in 2012, has reaped the benefits of continuing his international career alongside his club one, particularly with Northern Ireland’s resurgence under Michael O’Neill. He added: “For me, club football has always been positive. Going away with Northern Ireland, we’re in a good place and have been doing consistently very well. Early on my career I was constantly meeting up and losing games but under Michael O’Neill it’s been first class.